From Monday the 15th of April to Sunday the 21st, Extinction Rebellion Te Whanganui-a-Tara will be joining groups around the country in a week of non-violent action for the climate. On Monday 15th there will be a Gathering of Rebels public meeting featuring a range of speakers about the crises we face as a society. It will be held at Rutherford House, Lecture Theatre 1, beginning at 7pm. There’s a sour side to our white gold. It’s time to face the people who profit from the destruction of clean waterways. Dress up as a cow and listen to fresh-water ecologist Mike Joy speak about industrial dairy farming and its impact on Papatūānuku. 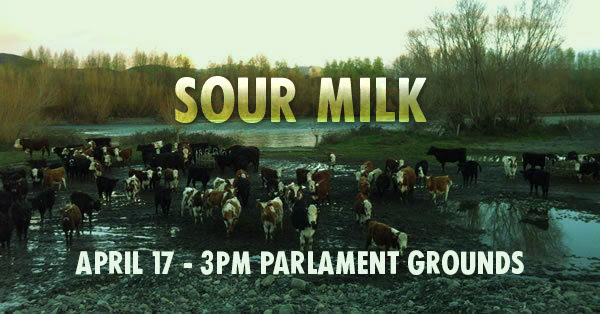 Join us in a cow onesie in front of the beehive to demand our government tell the truth about its water management practices and take action immediately to clean up our sour milk. The Week of Action will climax in a human wave for action on climate change on Saturday 20th. The wave will be gathering at Waitangi Park at 11am before moving throughout the city to symbolise the threat of rising seas and coastal inundation. “We would like to warmly invite everyone who wants strong action on climate change to come along and show that the seas are rising but so are we,” says spokesperson Dr Sea Rotmann. Given the shocking events in Christchurch, and continued high security presence of armed police throughout the country, Extinction Rebellion Te Whanganui-a-Tara wants to express clearly that we are an inclusive organisation committed to non-violence. Dr Sea Rotmann says, “We were all shocked by the events of 15th March. The School Strike 4 Climate displayed real hope and this was crushed by the shootings in Christchurch. The government to acknowledge the imminent climate change and mass extinction crises. A reduction in Aotearoa New Zealand’s greenhouse gas emissions to net zero by 2025. The creation of National Assemblies to manage this transition and decision making.